You can get to the Blue Lagoon in different ways, depending on where you are situated. The most common way is taking the bus until Marfa or Cirkewwa and then get the ferry that usually runs every 30 minutes to Blue Lagoon. The second option would be that of taking a boat excursion departing from Sliema, St Julians or Bugibba. Third option is obviously the most convenient and relaxing, hiring a private boat. Lets further see all the options in detail. Since the Blue Lagoon is on the island of Comino, the most important is to get to one of the following cities (Cirkewwa or Marfa) both of which have ferries running regularly (more or less every 30 minutes) to the Blue Lagoon with a Ferry Boat – Comino Ferry. Do not confuse with (Gozo Ferry – this is a far bigger ferry). From Valletta or Floriana: Take the direct bus number 41 that should possibly make 73 stops or number 42 that can stop 71 times. The ride is about 90 minutes, since you are departing from the main station, finding a decent seat is almost a guarantee. Here is the timetable of the line 41 and the timetable of the bus 42. From Sliema and St. Julians: take bus number 222, this is a direct bus and it drives for about 80 minutes, departing every 15 to 30 minutes and can possibly make 56 stops from Sliema and 49 if you are taking the bus from St. Julian’s. Find timetable and bus stops here. From Bugibba, Qawra or Xemxija: Take the bus 221 that drives for about 30 minutes and which should make approximately 41 stops. From Mellieha: all the buses with direction to Cirkewwa are a good option. From the Airport: Bus X1 drives for about 1 hour and can make around 24 stops. You can check the timetable here. For a bus to stop you should make a clear sign to the driver by raising your hand when the bus is approaching, make yourself visible, however, remain on the side walk while doing so. Buses in Malta are not necessarily stopping on all the bus stops, so remember that even if on the timetable there are many bus stops, in reality they make less. When approaching your bus stop, ring the bell to avoid missing your stop. All the mentioned above buses have Cirkewwa as their last stop and this is where you have to get out. Once you are here, you only have 2 options, going to Gozo or Comino. To find the departure point for Comino, once you’re off the bus, cross the Gozo Ferry boarding road and look for a sign “Comino Blue Lagoon” you should find a small stall with a kiosk selling food and drinks next to it. It is right by the sea and it is from here that the Ferries are departing for the Blue Lagoon. The ferry works regularly every day between March and November. The trip lasts 25 minutes on the outbound and 35 minutes at the return. The difference is because on the way back from Comino, the boat takes you on a little tour to see the Comino caves. A return ticket €13 in winter and €10 in summer. Kids under 10 have 50% discount. Groups over 10 people can benefit from a discount. Online bookings allow 10% discount, and you can book online here. First departure are at 9.00 o’clock and last one at 15.30 o’clock. The frequency is every 30 minutes in summer and every 60 minutes on the remaining months. Last return can be done at 16.00 o’clock, if you’re lucky enough, you might get a later one, however, this is risky since later boats only operate if there are people still waiting. There is a possibility of taking a boat to Gozo from Comino instead of returning to Malta and visit the other island. In this case, you can buy this type of ticket in advance. The trips obviously can be suspended in case of bad weather. So better to check with the company Comino Ferries before starting the trip to Cirkewwa, here is their website. If you are going by car, you need to follow the signs for Gozo until you arrive in Marfa, this is by far a better spot to drop off and park your car, here ferries also run at the same frequency as the one in Cirkewwa. Option 2: Excursions to Blue Lagoon from Sliema, St.Julians and Bugibba. There are different companies offering this boat excursion, different companies have different offers which usually include food and drinks included. Departures are at 10.00 and return at 18.00, this is not flexible, time is fixed. The prices vary from €25 to €50 depends of what package and type of boat you choose. From Bugibba prices are a bit cheaper due to a shorter distance €15 to €20. We advise people to arrive to the departure point ahead of time and get in the queue to get better places. Always check the details of your deal on your ticket. Excursion operators: Sea Adventure, Hera Cruises, Captain Morgan, Horn Blower (from Bugibba). Make sure not to be late for departure because these type of boats will not wait and neither come back for anyone that has missed it the boat. Hiring a private boat to visit the Blue Lagoon in Malta is by far the easiest and most comfortable option. Indeed many companies have inserted it as a normal charter route. The departure time can most of the time be agreed with the captain but it is generally between 9 or 10 o’ clock. You don’t want to arrive to Blue Lagoon too late when the commercial big boats have already arrived, arriving before will allow you to secure the best place to anchor whilst also give you time to enjoy the Blue Lagoon while it is quiet. If hiring a sailing yacht, the trip will last approximately 1.5 to 2 hours per way (if without stops for swimming during the sail). The skipper will usually show you some of the Comino caves on the way or allow the guests to try out using sails. Visiting Blue Lagoon with a sailing boat will allow you to stop in the crystal waters and swim in your own private peace. Ask your captain to show you other bays of Comino, as there are also other nice spots to see which might be more peaceful. The sailing yachts normally have a fully equipped kitchen and fridges, so you can make your day extra special by having lunch in the middle of Blue Lagoon. In case you don’ t want to cook for yourself, ask your captain for options. Our favorite is to get to Mgarr of Gozo for lunch. However, to moor the boat in Gozo there is a fee of about €25 for a half day stop. Prices of these types of excursions are between €400 to €550 for groups of up to 11 people (approximately €50 each). Bigger groups can be accommodated also at extra quote. Check the price of the seasons and more information by clicking here. Which is the best way to get to Blue Lagoon? If you have a car, then, you can arrive to Cirkewwa or Marfa and get to Blue Lagoon by Comino Ferry. If you are staying in central area or in the capital, Sea Adventure and Hera Cruises are the most value for money when comparing boats, Sea Adventure has the underwater sea view, while Hera has Turkish Gullets wooden boats. 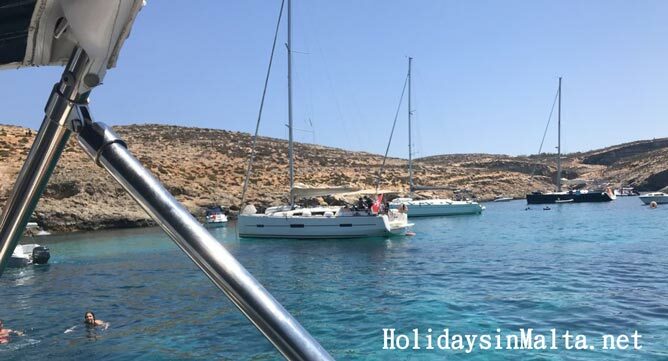 If you are visiting Comino as a group, and can afford splitting the cost of renting a private boat, this would by far be the most value for money option. This usually is an 8 hours charter, skipper and fuel included, with sufficient sitting and deck space, privacy and flexibility. Rest assured that it would be an unforgettable experience.